…It may seem small in comparison but our little clinic has evacuated over 200 people. I can’t tell you the number of lives that have probably been saved because of the efforts of our folks here. Our Coast Guard helicopters pack in as many people as they can, sometimes seven or eight or more people. What they can’t fit in a seat or on a stretcher, they put in their laps. These people are so resilient. For years they have been subjected to whatever comes their way, either man made or nature related and they survive. I watched little children with sever wounds be worked on with no pain medicine or anesthesia and not even whimper. One lady with a severe head trauma, along with multiple other wounds, have her scalp opened up and cleaned of gang green, she never flinched, and then when it was all done she got up and walked out of the clinic! They are grateful for Tylenol…something we take everyday. It is absolutely amazing. They are so open to prayer and a kind smile or a look of compassion. While most of our people wore a mask I couldn’t bring myself to wear one most of the time because I wanted them to see my face and know that I hurt with them and cared about them. One boy about 8 or 9 came in with a bad head wound; when they were done working on him they asked who brought him in. He said no one…his parents were killed when his house collapsed. He sat on the steps for two days, I don’t know what happened to him after that. I can only pray a relative found him and took him in. An 85 year old woman was carried in over the shoulders of a 15 year old kid. When we asked what happened he said the nursing home she was in collapsed…she was the only survivor. He just found her and brought her in. I didn’t think she was going to make it. As I prayer over her I asked God that if he were to take her to do it quickly, but if not to begin restoring her health. Three days later we were able to medivac her. Part of me couldn’t believe she lived the other part just stood in amazement at God’s faithfulness. I am brought to tears thinking that just as this father stayed with his daughter, consoling, holding, helping, caring, moving and caring for her, how much more does our Heavenly Father do this for us and we take it for granted? Take a moment. Think about it. So today was one of those lazy days watching football, kids playing, wife doing random things around the house. Wouldn’t you know it, dinner time crept up on us and we weren’t ready for it. I know, I know – dinner time happens every day at about the same time but for whatever reason we hadn’t thought about it (Clue #1). You’ve all had those types of conversations – no one really can make a decision and at the same time, you’re being lazy, not wanting to cook but also not wanting to admit that you really don’t want to go out either (Clue #2). April and I were both thinking that we shouldn’t go out but neither of us said it. So what did we do? Loaded up the kids and hit the hotdog joint only to find that it is closed on Sunday (Clue #3). Now the conversation begins all over again, this time with the kids interjecting their thoughts. Clue #4: April wanted the Italian place. I mentioned the Taco Bell/KFC, Logan wanted another place and of course Kendyl wanted yet another place. Great – did we get the message yet? NO!!! By this time it was getting late and we needed to be quick. We settled on Taco Bell/KFC. Clue #5: We walk in and there are people waiting for their orders and they have unhappy faces. Clue #6: We can’t decide what we want. Clue #7: The girl taking our order can’t explain to April what comes on the different Nacho platters. Clue #10: We wait 10 minutes for an order of Popcorn Chicken, Nacho Bell Grande, Baked Beans, & Mac & Cheese which cost us $10.45. Clue #11: They charged us $0.10 for lettuce on the Nachos and only put 3 shreds on it. The single serving of Mac & Chesse was more like 2 teaspoons worth. Clue #12: When April took her Nachos back to complain the line for complaints was 2 deep AND when she got a new order of Nachos, they weren’t the right ones! I could go further but you get the picture. Why did we miss all of the clues along the way? What was blocking our view of the obvious? April and I both know we didn’t need to go out for dinner. We both felt it inside. It was like so clear – I really FELT that we shouldn’t go but I disobeyed! April disobeyed! We disobeyed God speaking to us. Say what you want but I believe God was telling us not to go out to dinner. We had a miserable time, left unhappy, and even left still hungry. How many times does God speak to and you don’t listen? I’m thinking of Exodus Chapter 4 where God is giving Moses signs for the people; you know, like when the staff turns into a serpant, Moses puts his hand inside his coat and it has turned leporous, he puts his hand back in the coat and the leporsy is gone and then if the people still don’t believe, Moses is to take water from the Nile and put it on the dry ground where the water will turn to blood. I don’t know about you but if I saw those things happen, I would certainly believe I was hearing from God yet Moses was scared that the people would not. I had at least 12 clues that I should have recognized but I didn’t until it was too late. Lesson: Get a Clue! They mean what they mean and I need to understand and follow through with action! Steven Curtis Chapman – An awesome Man of God. Yep, that’s a picture of April and I with him. 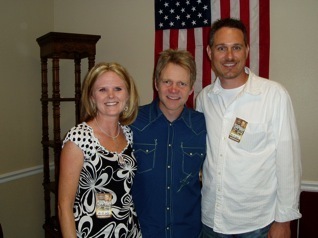 We had the opportunity to meet him after a concert a few weeks ago here in New Port Richey. Steven is the first Christian Musician that I was introduced to and liked. His music has been a huge part of my life since 1992. His music was integral in our marriage ceremony as well. Our vows were the chorus’ from 3 of his songs that he wrote for his wife. Our marriage has “grown up” around Steven and his music. Today started out well enough – bagel and coffee at Panera while I was troubleshooting my boss’ laptop wireless connectivity. While there April called and informed me that Steven’s youngest daughter, 5 year old Maria, was tragically killed in her driveway yesterday. She was run over by one of her older brothers. You can read more about it here: http://www.StevenCurtisChapman.com. The short version of the story is this: Steven was in a hurry to finish his latest album and was rushing Maria and Stevie Joy through bath time. It seemed that everytime he turned around, they had disappeared and when he found them, they were dressed in princess gowns dancing around their room (Snow White, Cinderella, Little Mermaid, etc. – you get the picture). Steven was too worried about what he had to accomplish that he found himself upset with his girls for not rushing right along with him. As parents, we all know how that goes, right? After getting the girls to bed and retreating to his studio, Steven felt convicted about what had just happened. His girls would only be this little for right now. He needed to enjoy THIS MOMENT because THIS MOMENT only lasts for THIS MOMENT and once THIS MOMENT is gone, THIS MOMENT can never be lived again. Was the song prophetic when the lyrics said “‘Cause all too soon the clock will strike midnight and she’ll be gone.”? I found myself this morning thinking about my girls, my impatience with them at times, and thinking about all of the MOMENTS that I have missed because I had more important things to do. What about you? Do you miss those MOMENTS too? In some ways I feel guilty because I didn’t take the time to make a memory, but I also know that through Steven’s tragedy, I have learned a valuable lesson. I know that I’m not perfect and no one expects me to be, but being father is one of the most blessed opportunities that God could ever give anyone. I need to take advantage of the MOMENTS God has placed in front of me and quit worrying about myself. I’ll never understand why it takes a tragedy for us to learn valuable lessons like these. I do understand that God has had this as a part of His plan since the beginning of time – to teach me a valuable lesson about fatherhood. I also now that God will use this tragedy in Chapman family to bring Glory unto himself. As I was talking to a friend today I realized that God can and will use this for His greater glory. You see, Maria, Stevie Joy, and Shaohannah were all adopted by the Chapman family from China over the course of the last 5 years or so. God will use Maria’s death as a way to bless the Chapman’s foundation (see http://www.ShaohannasHope.com) which supports adoption. Many more orphaned children will now have the privilege of being adopted into a loving, caring, and providing family. The Chapman family is asking that in lieu of flowers, that donations be made to Shaohannah’s Hope in memory of Maria. Those funds will allow hundreds, or perhaps thousands of families adopt children who are in desperate need of a family. China just had a major earthquake. How many children have been left without parents to care for them? Take a MOMENT and create a memory. Take a MOMENT and Glorify Him! I was listening to the radio yesterday and the discussion centered on the 9 year old boys in Georgia who had plotted to kill their teacher. This led me to begin thinking about being a parent and I came to the conclusion that no matter what we do in raising our children, we will be wrong. What? Did I say that? Hear me out. 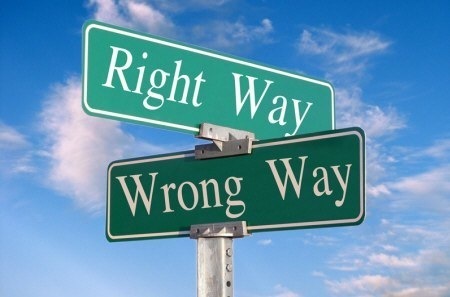 THE RIGHT WAY: As we go through life, any decent parent will discipline their children as they deem fit. For example: I could be shopping at the mall with Kendyl or Logan and let’s say they begin to misbehave. I give them a little slap on the hand or on the behind in order to bring them back in line. They react with an “OUCH”. Jimmy Bob, who happens to be walking by, gets out his cell phone and calls the police because he says I was abusing my children. I get in trouble for disciplining my child and society says I was wrong for doing so. THE WRONG WAY: On the other hand, I am shopping in the mall with Kendyl or Logan and they are running around like wild girls, tearing clothing off of the racks, spilling their drinks all over the floor, and acting like selfish pigs. They grow up to be girls who believe they can do what they want, when they want and that they do not have to respect authority. As they grow in life, they become what society would deem a failure and they are that way because I, as their parent, didn’t raise them (discipline them) properly. I guess I was wrong in this case as well. These verses tell us that we need to train our children properly and they will not wander from their ways as they grow older. We are also implored to impart wisdom upon our children through discipline. These words of advice are from God, NOT MAN! As long as we are in harmony with God’s plan, we have nothing to worry about; we are not wrong! WE ARE BEING PARENTS!!! So… Just be a parent. The title says it all. I have a new job beginning April 15th. I was hired as the I.T. Manager for Grace Family Church in Lutz, FL. Good-bye to the Pasco County Schools and hello to Grace Family! (I hope they don’t mind that I borrowed the above image from their website at: http://www.GraceFamilyChurch.org). Grace Family approached me a couple of months ago and I was asked if I was interested in becoming their database manager. In all honesty, I wasn’t too interested but thought it wouldn’t hurt to at least talk to them. Perhaps I could learn more about their church since we were actively seeking a new church home. I felt the first interview went well, but in the end it was decided that they really didn’t need to hire someone to manage their database. Ok, I was fine with that. I was perfectly happy in my current job. Well, just a couple of weeks ago they called and mentioned that there were some changes upcoming and they wanted to know if I would be interested in the I.T. Manager position. This time I was pretty excited. I interviewed a week ago yesterday and was offered the job later that same evening. Through much prayer and discussion over the last weekend, April and I decided that this was a great move for our family. So why is this so “Hard to Imagine”? For various reasons (which I won’t go into here on the blog) we lost contact with some good friends of ours a little over a year ago. When my brother and his family moved over here, we attended a Saturday night Service at Grace Family with them. A few weeks later we rec’d an email from our “lost” friends asking if we had been to Grace Family as they thought they had seen us there. Long story turning short, we have re-established our relationship with these friends and it was also through them that I first heard about this job. The re-establishment of this friendship also has given us a perfect Christ-like example of complete forgiveness for at that particular time in our lives, we were in dire need of that very example! And yes, it is very “Easy to Believe”! We serve a big God with a greater purpose than our own. God took a broken friendship, gave a perfect example of forgiveness to us through it all, AND THEN used that restored relationship to provide me with a new job where I can combine 2 passions (ministry and I.T.) into one purpose for His ultimate glory! That is “Hard to Imagine, Easy to Believe”. WOW! This has been one fun day. The kids woke us up early (as could be expected) and we were opening presents by 7:30 a.m. We always begin our Christmas morning by reading the Christmas story from Luke 2, we pray as a family, and then sing Happy Birthday to Jesus. I’m not going to go into everything that the Santa brought the girls other than to say that they have been extremely spoiled by Santa and all of the Grandparents. About 9:30 a.m. April’s parents arrived at our place and shortly thereafter Grandma Goodger arrived with Grandpa. She picked him up from the nursing home and brought him over. We had a very nice day with them. The afternoon was spent with everyone playing the Wii. Both Grandma and Grandpa Goodger enjoyed bowling. Pappy also bowled a few games with the girls. About 3:30 we left and headed over to Kaisa (Scott’s Mom) and Poppy’s house. Grandma and Grandpa stayed about an hour and then headed out for the day. Brian, Kris and the Kids, Ron, Nikki & the Kids, Dennis, and Kris’ Parents were all there. What fun it was to see 7 Grandkids running around! It was Chaos but in an extremely fun way. I pray that your Christmas day was as blessed as ours was. Today was a day where we could truly see the Love of Christ shining through upon everyone. Today is a day to celebrate the birth of a small child who was born to a Virgin, Mary, in a lowly manger. As the song says – “This is such a strange way to save the world”. God works in mysterious ways and unexpected ways. What has he done for you this Christmas season? Email us and let us know!